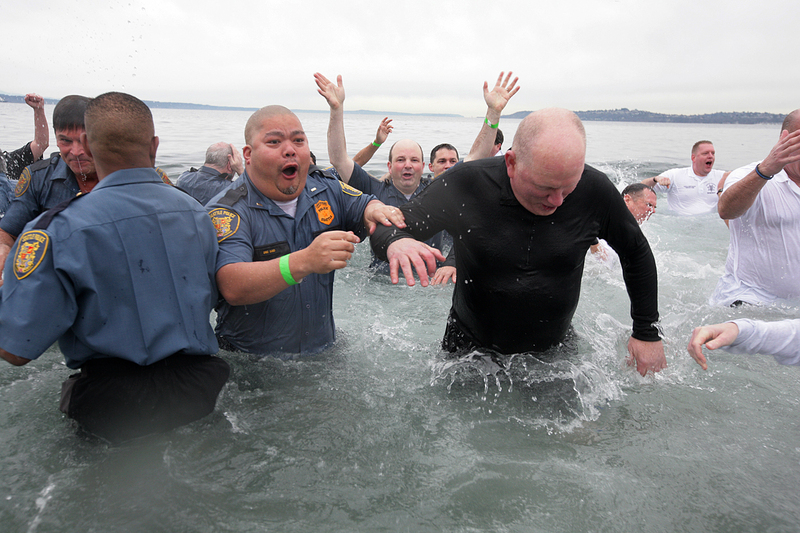 Special Olympics of Washington raised over $30,000 yesterday as approximately 300 people, who raised a minimum of $50/each, braved the 45 degree water of Puget Sound off Alki Beach in Seattle. This was actually my first time photographing a polar plunge and I learned a lot about where to stand and where not to stand as saltwater splashed my expensive camera gear, which thankfully appears to be fine. A couple of colleagues were apparently not as lucky as they lost their equiptment to the sea. To see more photos from the event, go to http://www.photoshelter.com/c/merylschenker . Click on the image of the woman in the water to see more images from the event.